Figure 4.1 Form analogy. The aerial photograph (a) shows asymmetrical, parabolic drumlins. These bedforms are pointed up-flow and widen and grade gently into the surrounding surface distally. The asymmetry is about a dividing plane parallel to the flow and passing through the leading point. The sole marks or erosional marks (b) are orders of magnitude smaller in scale yet remarkably similar in form—asymmetrical, pointed up-flow, broadening and decreasing in depth down-flow (towards the bottom of the figure). Note the esker at e (Fig. 1a) and how the stream that formed the esker cut a tunnel channel over the drumlin. In the meltwater hypothesis, this combination represents a late stage of meltwater activity following the sheet flow that formed the drumlins. difficult to argue for widespread meltwater activity extending to the so-called ice divides. Much of the discussion relates to subglacial landforms, both in surficial sediment and in rock. Finally, evidence for large-scale drainage paths and their broad significance is presented. 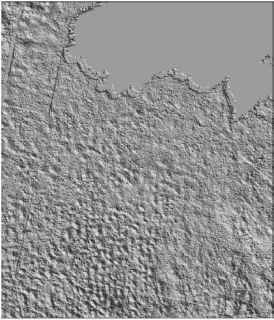 Subglacial landforms such as drumlins are commonly considered enigmatic because their formation has not been observed. We can, however, learn about the subglacial environment by studying its landforms. In the absence of actualistic observation, use of analogy is probably the best way to begin study of subglacial bedforms. By analogy, landforms and other features of known origin that resemble drumlins or other subglacial land-forms are used to fill in the missing information about the subglacial processes that created immense fields of these streamlined landforms (Fig. 4.1). The sets of analogues pairing subglacial bedforms with features created by turbulent fluids challenges modern drumlin studies holding that drumlins are formed by direct ice action on a deforming bed (Shaw, 1996). Erosional marks are formed by turbulent, low-viscosity flows that behave very differently than the high viscosity flows of ice and deforming sediment straining under stress applied by ice. The Reynolds number for water and wind analogues (>104) of subglacial forms compared with possible ice-flow analogies (Re ~ 10-17) makes it extremely unlikely that actualistic wind and fluvial processes can be used as analogues for ice action and vice versa. If the meltwater explanation for drumlins and other bedforms is to be taken seriously, it is important to demonstrate that melt-water was available at the site of their formation. Some models of ice-sheet evolution include cold-bed conditions that preclude the meltwater hypothesis (Dyke, 1993; Kleman & Hatterstrand, 1999). The evidence for meltwater lies in sediments and geomor-phology of the inner zones of the continental ice sheets, and the absence of melting would restrict the possibility of hydraulic connectivity between their inner and outer zones. The thermal and liquid water conditions are deduced from reconstruction of the processes that created the sediment and landforms. In this regard, the landforms and sediment more-or-less speak for themselves. By interpreting the drumlins as meltwater forms, water necessary for their formation is invoked. Each future step in thinking carries the meltwater assumption and the observations to come must be compatible with water action if the hypothesis is kept. Should an observation flatly contradict this assumption, the hypothesis must be rejected. Thus, we are in search of the very evidence that will falsify the basic assumption of our hypothesis. The most significant question asks whether or not there was sufficient meltwater to form the subglacial landscape. The required magnitude of meltwater requires reservoir storage. The reservoirs and the source of water may have been subglacial and/or supraglacial. Supraglacial reservoirs may be favoured by abundant subglacial water. Reservoirs at the ice bed would cause flattening of the surface (Shoemaker, 1991) and, with climatic warming, the potential for supraglacial reservoirs in a greatly expanded ablation zone. Connection of a supraglacial lake with the bed (Zwally et al., 2002a) might well have triggered megafloods (Shaw, 1996). Figure 4.2 Stratified Sveg till (melt-out till, Shaw, 1979) and stratified sediment in Rogen moraine, Lake Albanel, northern Quebec. The bedded Sveg tills indicate abundant meltwater at the time of freezing-on and melting out. The draped, stratified and sorted sediment over the boulder (Fig. 4.2a) marks differential melting related to ice content. The deposits in the Rogen moraine show mainly graded deposits from suspension and minor deformation in boudinage where debris flowed in an extensional mode. A rock moving under gravity distorted primary graded bedding. This combination indicates deposition from suspension with minor sediment flow under gravity. A cavity environment with deposition of sorted sediment is suggested. Figure 4.3 The meltwater model. Shaw, 1979), rests on the fine-grained lodgement till. The Sveg Till marks an abrupt change in depositional regime. Its entrainment and deposition requires abundant meltwater for the freezing-on in the first place and subsequent melt-out of entrained basal debris (Shaw, 1979). 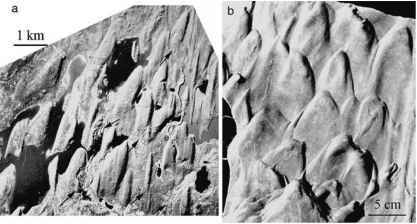 The deposits of Rogen moraines are like the melt-out tills, relatively coarse, but they contain even more water-sorted sediment in thicker beds (Shaw, 1979; Bouchard, 1989; Fisher & Shaw, 1992). The sedimentological and geomorphological evidence leaves no doubt that much of the inner zones of the Keewatin and Nouveau Quebec domes of the Laurentide Ice Sheet (Aylsworth & Shilts, 1989a; Bouchard, 1989) were warm based. Similarly, the interior of the Scandinavian Ice Sheet shows striations and lodgement tills and Rogen ridges there are composed of very local lithologies with ubiquitous sorted sediment indicating either formation by meltwater erosion and deposition or entrainment of sorted sediment prior to melt-out (Shaw, 1979). The so-called Sveg tills (Fig. 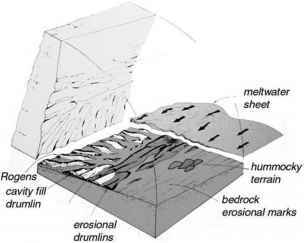 4.2a & b) required meltwater at the bed during debris accretion and deposition. A deep investigation into the origin of Rogen moraine or Sveg tills is not necessary to support the view that there was abundant meltwater in the inner parts of the Scandinavian and Laurentide ice sheets. A cursory view of the sorting and stratification in the Sveg tills and associated Rogen moraines points to an abundance of subglacial meltwater at the time of their formation (Fig. 4.2). Beyond the reasoning that the subglacial sediment indicates large quantities of meltwater in the inner zone (Fig. 4.3), the landforms have a story to tell. One of the most intriguing features of the Pleistocene ice sheets is the landscape they left behind. Much of this landscape appears almost synoptic: a vast, pristine, subglacial bed, although cross-cutting relationships show some time transgression (Shaw, 1996). The pristine nature of the landscape suggests that it was preserved with little alteration through deglaciation. Such subglacial landscapes were formed about the time of the late-glacial maxima of the ice-sheets; end moraines are surprisingly rare along the flow paths. This can only mean that recessional landforms were not formed over vast areas of the deglaciated landscape. We can speculate that meltwater storage and flow beneath the ice sheet caused flattening. When the ice returned to its bed, which sloped back up-glacier, there was insufficient slope to drive glacier flow. Melting under a regionally stagnant ice sheet is exactly the condition for the observed pristine subglacial ice-sheet bed. Nevertheless, there are arcuate end moraines associated with the Great Lakes, especially Erie and Michigan. There are also intriguing, nested, arcuate forms where the Bow Valley glacier spread out onto the Plains from its confined mountain and foothill valley. It is probable that these moraines represent local reactivation of the ice sheet following the last outburst. They are not to be confused with the giant ripples described by Beaney & Shaw (2000) further south in Alberta. Bedforms of many types adorn the former bed of the Laurentide ice sheet. They indicate that for much of the landscape subglacial processes seem to have come to an abrupt halt. Assume the following for the sake of hypothesis testing: the landforms considered here are created mainly by meltwater. This is not to say that all subglacial landforms are fluvioglacial. 4.3 & 4.4). The competence of this flow causes transport of all but the very largest boulders in its path. As well, cross-cutting assemblages of landforms may mark changes in current direction within broad flows. The geometry of the flow changes over the life of an event with an increasing formation of channels and a reduction in extent of sheet flow. Following an outburst, much of the glacier stagnates and melts in situ. The hypothesis explains the landforms at a basic level at which the hypothesis is expressed in the first instance. There would be no point in proceeding if this were not the case. What has been done over the past 20yr or so is to test the hypothesis in terms of its ability to explain new observations.